I am a huge fan of online workshops and workshops on dvd. You do not have to leave the house (which is convenient if you are a person that is a homester (if this is a wrong google translation: i mean i like to stay comfortable at my home). You can watch again for a very interesting part, or double the speed for less interesting parts. So i took a plunge and went for the creative jumpstart at Nat Kalbach’s blog (go to http://nathaliesstudio.com/tutorials/). Not that i am a regular on have artist’s block’s. But i like to see how others works and think. I love the creative jumpstart series, and some posts immediatly made me try out the technique. Dina Wakley (see her blog http://dinastamps.typepad.com/) mentioned the painting with paper technique. As a lover of paper, i had to try it out and i will do it more often. It’s relaxing and gives maximum output with minimum effort (well: at least to me). 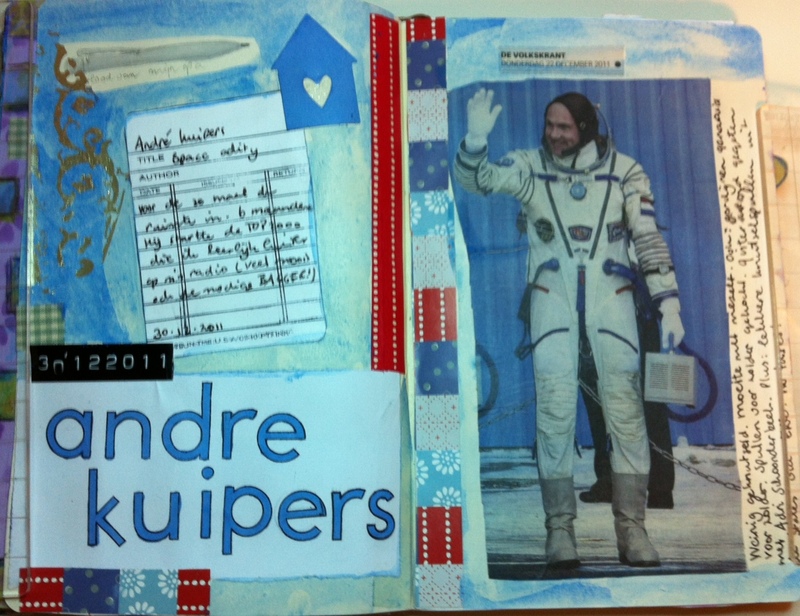 Next journalpage is about Andre Kuipers, a Dutch astronaut who is in space for a couple of months. This picture appealed to me because it seems outdated (his helmet!) and yet intriguing that he really is in space right now. 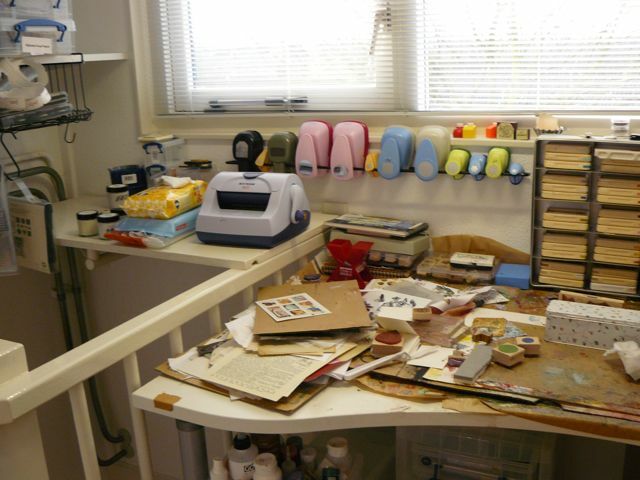 Are you ever in a creative rut? I always try to keep going. Maybe not always on the same level of creativity (making color swatches, making samples of mediums) but going, flowing. Even if feeling not creative, you can try out. 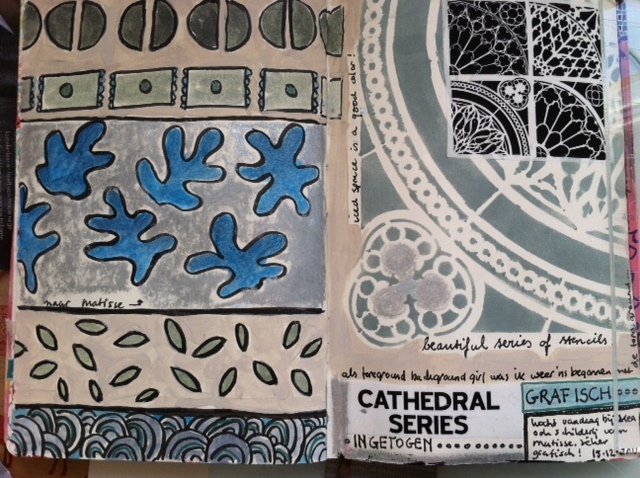 That is what i had in mind making this artjournal yesterday evening. Knowing your materials wil make you a better artist ANYWAY]. Here are a few pages i have made in the recent past. 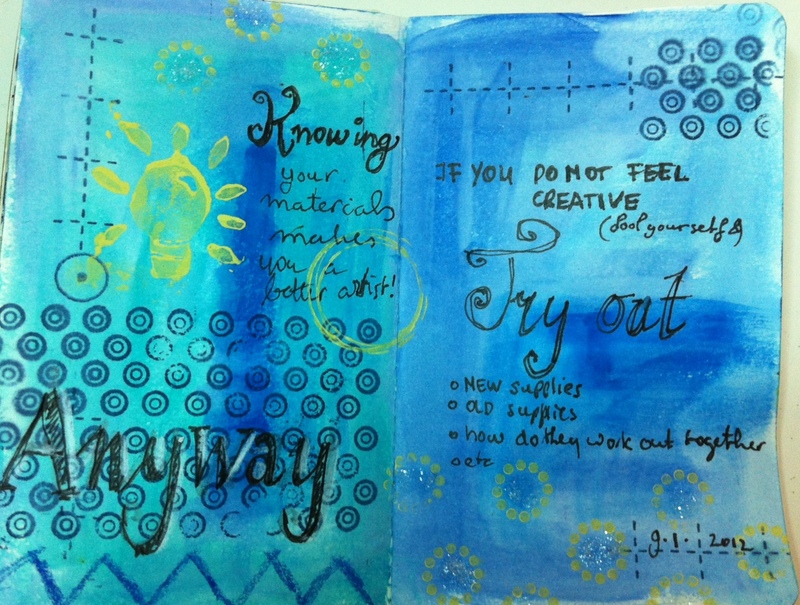 Above journal page is what i made after seeing Dina Wakley ‘s contribution to Creative Jumpstart series (for Dina see http://dinastamps.typepad.com/ for Creative Jumpstart go to Nat Kalbach’s blog and request a password if you don’t have it already http://nathaliesstudio.com/tutorials/ ). 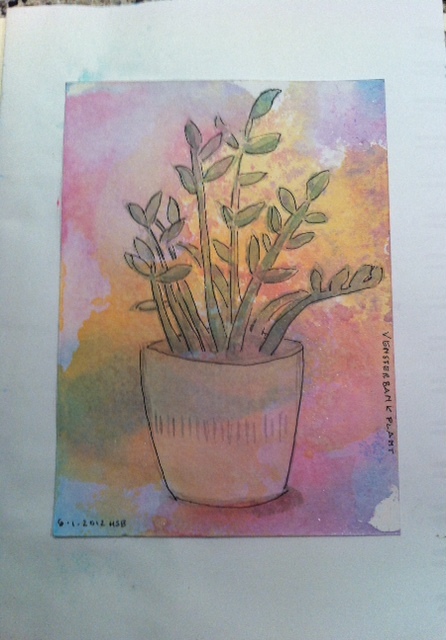 I want to add more drawings to my journals; this is a plant that stands in my window. (I will put it on my resulotions for 2012 list 😉 along with blogging more often). 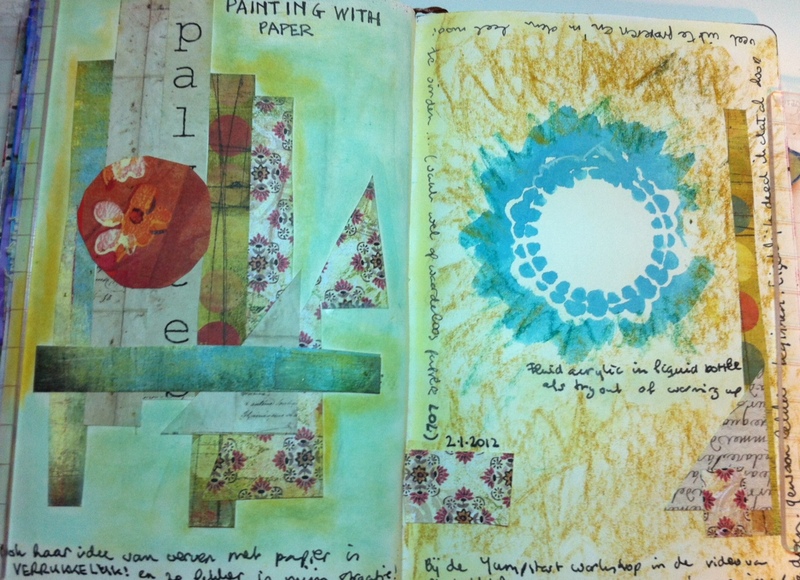 This (not so sharp) picture is of a journal page on my recent studio remodeling. 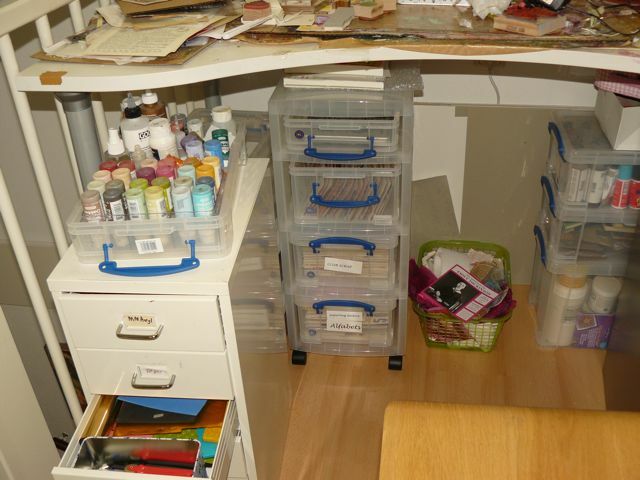 Shows my love for paint, paper and a not-so-tidy crafter hehe. Hi outhere, it has been long since i have been blogging. 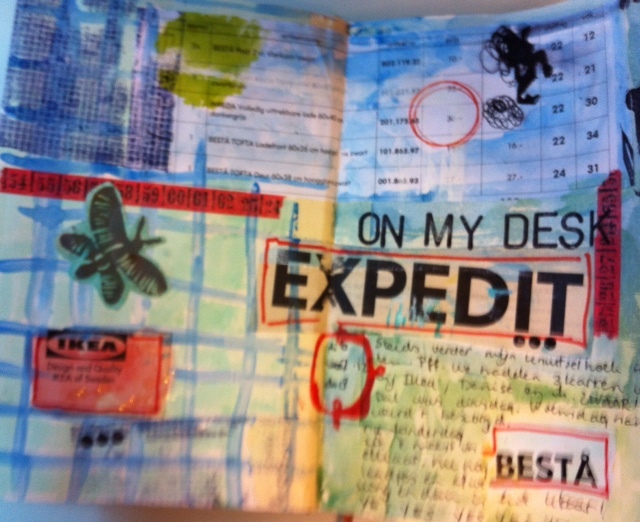 Making art continued and i have been art journaling almost everyday. 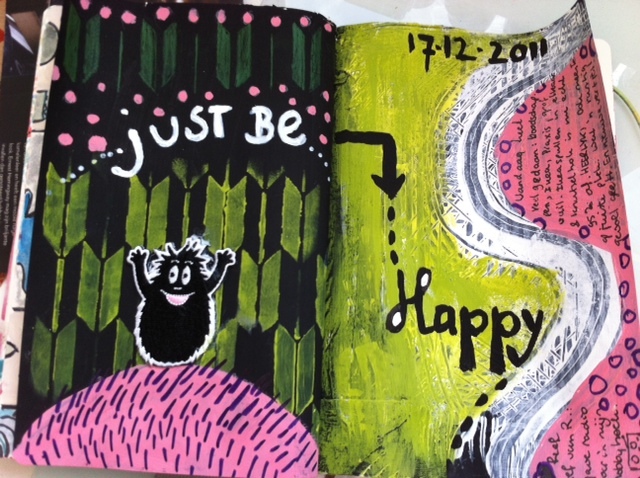 (if you wish doing that, but have no succes yet, i recommend julie fei fan balzer’s art journaling class; you can find it here http://balzerdesigns.typepad.com/balzer_designs/online-classes.html scroll down a little bit). Last months we have been busy remodeling our house: we have a new kitchen and we have rebuilt our attic. 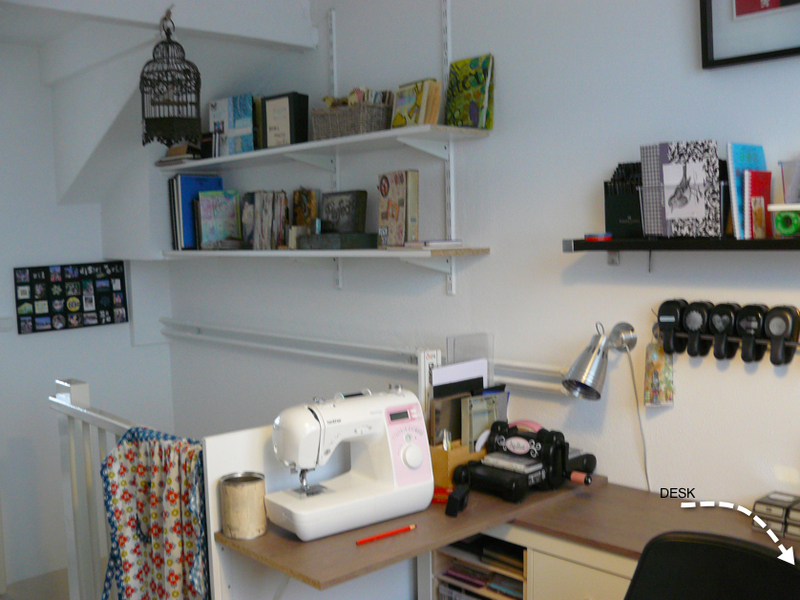 Which means i now have a real studio, in stead of a hobby corner. 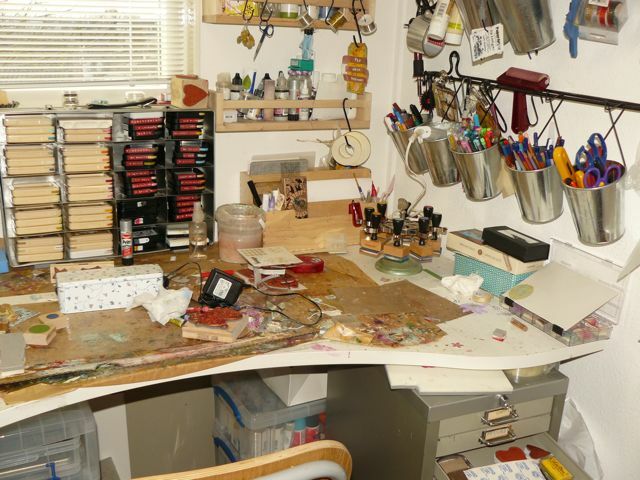 Here are some pictures of my old hobbycorner which means a table and very little space to store (click on the picture to see a bigger version). And… tata…. These are pictures of my new studio. 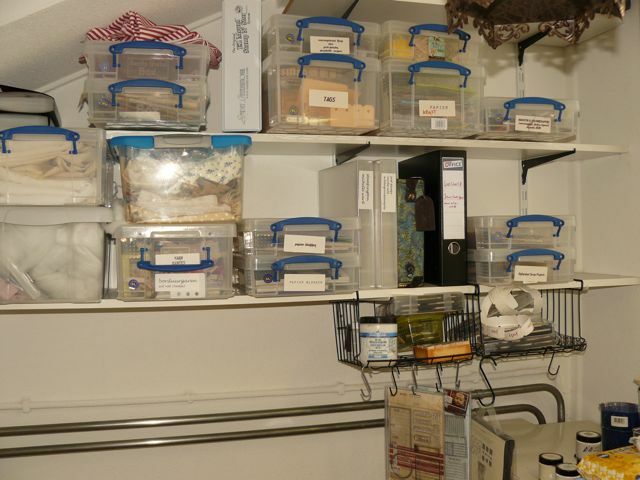 Much more space to store materials, much more room to create! Ikea has done good bussiness on me. 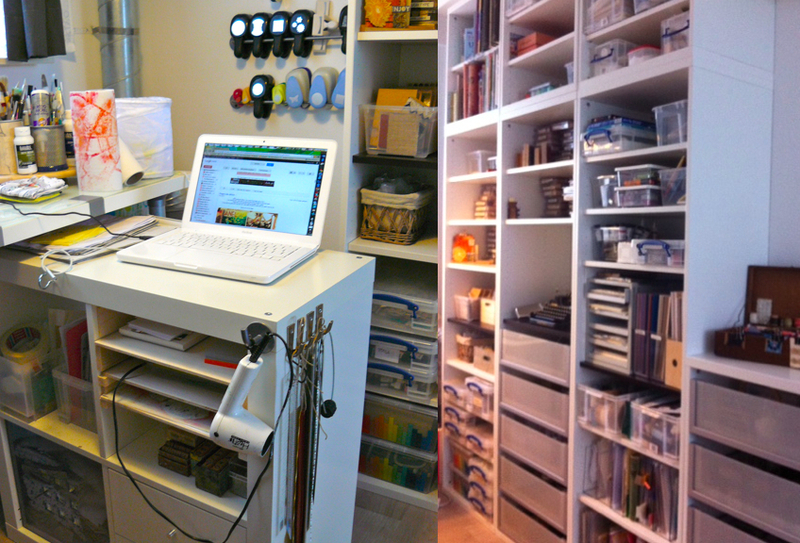 I have their Besta shelf units and Expedit bookcase (eeh….. and many other stuff). 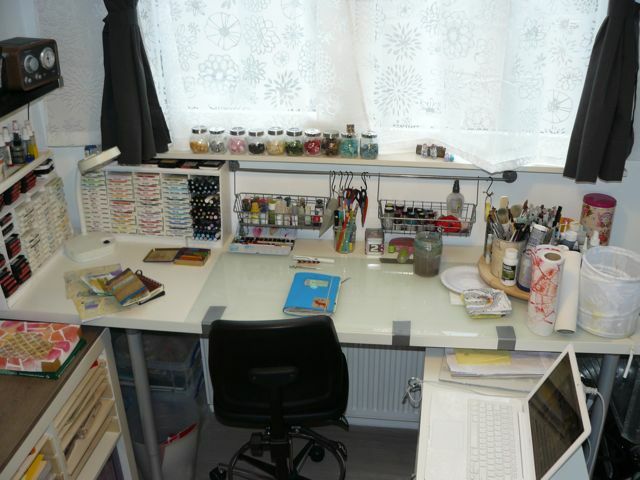 And though it is still a small studio, just because it is small everything is on my fingertips. I love, love it! PS: Pffew, this was my first blog in many, many month, even had to reset my pass word and had some trouble finding the most simple things, but after a while it came back to me… Hope to post more often in the near future!